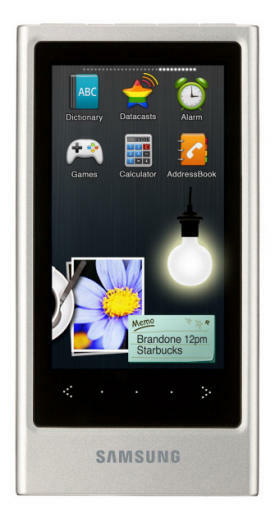 Samsung have announced the Samsung P3 at CES 2009, a brand new MP4 player that features a new touchscreen haptic user interface that’s designed to take on the iPod Touch at its own game. The iPod Touch made existing MP3 players look as outdated as mobile phones when the iPhone came out, but this may not be the case much longer. The Samsung P3 is just one of a new generation of MP3 and MP4 players that offer a brand new touch-based user interface that brings them far closer to the iPod Touch than ever before. So what does the Samsung P3 offer? Well, obviously an MP3 player, and a nice set of features for organizing your music. You can access your favourite tunes instantly, for example, through the use of a Music Hot Touch Key, while the touchscreen user interface lets you choose tunes by pushing virtual keys and swiping your finger across the screen. As its a haptic interface, the device vibrates whenever you push a virtual key, giving you instant feedback of your actions. The screen itself is a 3″ widescreen 16:9 format, which is useful for watching videos on, which you can watch in MPEG4, WMV and SVI formats. The P3 also sports integrated speakers with Samsung’s amusingly-named DNSe 3.0 sound enhancement technology, and comes with storage of up to 32GB. As you can see form the pictures of the P3, it also offers a variety of other features, including FM radio, several games, address book, alarm, calculator – in fact, the types of thing you’d find in a mobile phone. 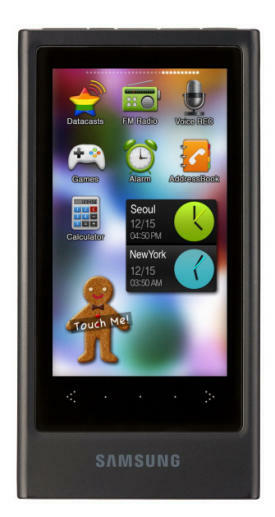 Indeed, the P3’s user interface is called the EmoTure touch interface, which by the looks of it, seems very similar to the Samsung Tocco touchscreen mobile phone. Looking at the P3, then, I can’t help but feel it’s a top-end Samsung phone that’s had its mobile phone internals ripped out – but then, that’s no bad thing! The user interface certainly looks good, and the brushed aluminium of the device’s body makes it exude a cool and stylish look. No pricing or release date has yet been announced, which is annoying, as the price will surely dictate how successful the Samsung P3 will be compared to the iPod Touch. Great thanks for that video. I was looking for this kind of content. Samsung is getting on top! i need to know price of phone can not find it, pls email me with price.